Although the paintings of Andy Warhol are famous for a flatness whose paradoxical depth and nuance speaks volumes about our age, one would expect that since Warhol is not a writer, his book about his most creative and productive period would be only flat – nothing more than a tedious litany of dropped names minutely dissected, resulting in only the barest hint of what the sixties were like. But one would be wrong. Because Warhol and Hackett have written a book that is as deep and insightful about that decade – and America – as anything I’ve read. Somehow they have managed to convey the feeling of the times that transcends the words on the pages. There is a palpable, giddy energy one experiences at the beginning of the book (which starts at the beginning of the sixties), an atmosphere of great possibility. The sense that opportunity abounds – for individuals and the nation – and that with hard work and a little luck, miracles are achievable. And at the end? Unbearable fatigue. A kind of fatness – not a Ruebens-esque voluptuous luxury, but the bloated and flatulent lethargy of careless lassitude. By the end of the book one feels that by the end of the sixties, everyone was just sick of everything. Of the decade, the art, each other, themselves. They are like children who have had too much birthday cake and candy and need to go home. It is an amazing feat and it’s one of the things that makes the book worth reading. Which can be dismissed as merely the superficial prattle of the out-of-touch elitist that Warhol often pretended to be, or embraced as the spot-on insight that there was a fundamental change about to hit America – made by someone very aware of what the products people use say about them. Or maybe, like the rest of Warhol’s art, it’s a bit of both. “POPism” does not purport to be an encyclopedic overview of that entire tumultuous decade. It is only about Warhol’s corner of it, and how that corner waxed and waned as Warhol’s entourage and entanglements evolved. It begins as Pop Art is just starting to appear upon a scene dominated by the monolithic seriousness of Abstract Expressionists like Rothko and Pollock – when Warhol himself was simply a very successful illustrator for the fashion industry – and continues through Warhol’s rise and popularity, both as an artist and as a celebrity. As he moves from a brownstone to “The Factory”. As he meets Edie Sedgwick. As the Velvet Underground are formed. As he shoots “Chelsea Girls”. As Valerie Solanis shoots him. As he dies, and then is brought back from death. As his life becomes increasingly less about the art and more about the circus the art creates – which becomes its own kind of art. Warhol did. And does. Do you? 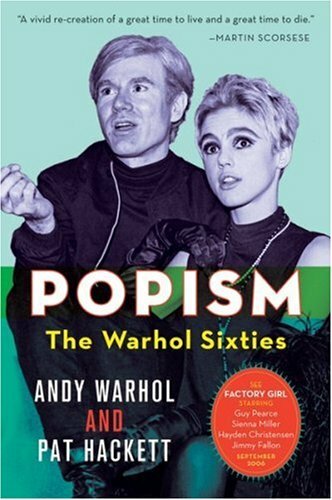 POPism: The Warhol Sixties by Andy Warhol & Pat Hackett was published by Harvest Books on 09/05/06 – order it from Amazon here or from Barnes & Noble here – or pick it up at your local bookseller (find one here).